The first proper effort at a netbook from Sony, the new VAIO W series, comes a long, long while after everyone else has already delivered their versions, comes in a bit pricier (as expected I suppose) but better designed (again, as expected). You know exactly what to expect from a netbook these days. Nine times out of ten it will be powered by a 1.6GHz CPU, with a gig of RAM and more often than not come in a 10.1-inch chassis. They all share the same Intel GMA graphics, and you'd expect to get a decent amount of play-time on the move. What you get with the VAIO W series for your extra cash over something like the Wind, Eee or Samsung netbooks though is a Memory Stick Pro Duo port and an ever so slightly higher resolution screen. Which is all well and good for general web-browsing and productivity, but the actual desktop ends up just looking that little bit too small for comfortable viewing. For all that though it is a gorgeous screen. But the design side of things is far better. This VAIO looks like the sexiest netbook I've seen in a long time. The curved edges and recessed ports give it a really nice feel as does the textured nature of the open side of the laptop. The keyboard though doesn't hold up its end of the bargain. It's uncomfortable to type on for any period of time, with tiny, unresponsive keys and too many function buttons with the smallest left-hand shift key we've seen on a netbook. The real killer of the VAIO netbook though is the battery life. I can forgive practically everything else on a machine so long as it will keep running for a decent length of time when not being taxed too hard. Anything around six hours and I'm happy. The three hour battery life of the VAIO leaves me stone cold. So it's beautifully designed, with a great screen, but over-priced and under-specced for the cash. So, in short it's exactly what you would expect from a Sony laptop. 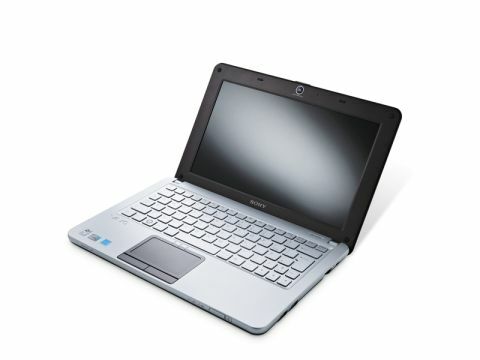 It also comes in white and pink if you feel you have to have a Sony if you're going to have a netbook.